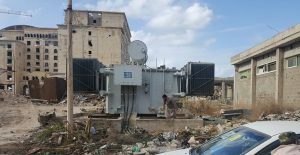 GECOL engineers have completed work on a new electricity substation in Benghazi’s war-ravaged Ssbri district. The substation in the shadow of the uncompleted and now badly-damaged Hyatt Regency hotel has been connected to the high voltage distribution system. Engineers are now working on local cabling. The state power company says that very shortly parts of Sabri will be getting their first electricity in four years.